A special feminine jacket full of romantic feelings! 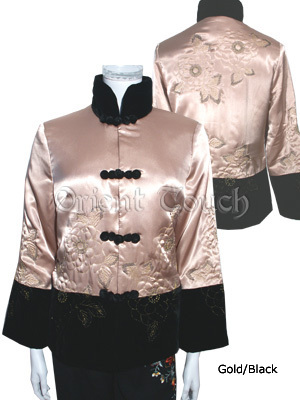 This delightful jacket is made of quality Thai silk and features embroidered blooming roses all around. Indulge yourself in the rose garden, you will feel pride, delightful and happy. With mandarin collar in fashionable neckline cutting, it is detailed in contrasting fuchsia fabric as lining and folded sleeves. The fuchsia color brights the jacket and makes it even more outstanding and decent. Make it yours, you will be special and unique. simple wedding dress asia appareldestination wedding dress .